The cantina of Calabretta, despite being on the main road through Randazzo, is easy to miss. We just about managed to locate it the previous day, Sunday, when it looked pretty much like it did in Street View, shown below (click image to go to Google Street View). There may have been a sign to indicate its presence, but we couldn’t find one. The following afternoon however, the shutters were open and the cellar man Salvatore was by the entrance to greet us. It soon became apparent that Salvatore had about as little English as we had Italian, and only a little longer to discover that actually it did not matter. We could get the drift of most of what he said, and he seemed to understand most of our blend of English and pidgin Italian. His friendly smiling manner helped no end, and the more technical it got the easier it was. Fermentazione malolattica? No problem. He showed us a list of wines that we were to taste: Carricante 2012, Nerello Cappuccio 2012, Nonna Concetta 2012, Contrada dei Centinari 2012, Pinot Noir 2012, Pinot Noir 2013, Etna Rosso 2012, Etna Rosso 2010, Etna Rosso 2007, Etna Rosso 2005. The non-varietally named wines were basically Nerello Mascalese, the Etna Rosso also having some Nerello Cappuccio. With the list in mind, we set about exploring the cantina to find each of the wines. As at Terre Nere, this was to be a tasting from barrel and (here) stainless steel tank. As I remember it, the cantina consisted of the basement, ground floor and first floor of the small block shown in Street View above, plus some out buildings in the yard behind, and it certainly felt like we visited all corners. It’s amazing how much wine you can store in a small space. 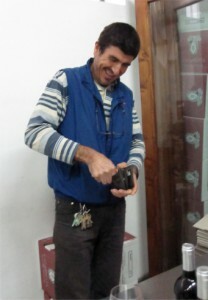 It seemed chaotic, but was clean, and Salvatore knew exactly where to find each wine. My tasting notes are so sketchy as to be meaningless to anyone else, so I will just give some brief more-or-less general impressions here. Overall I was very impressed, with all my scores being **** or *****. Supposedly Calabretta make wine in a more traditional manner than most Etna producers, for example favouring large barrel maturation to barrique. I am not sure I was (or am now) knowledgeable enough to be able to recognise that traditional quality in the wines, but I will say that they generally had a straightforward fresh honest simplicity about them, which I liked a lot. The Nonna Concietta 2012 and the Etna Rosso 2012 had a raisiny note, which I also came across in Etna wines of other producers. Normally I do not like that character, associating it with flabby wines made from over-ripe grapes. But the raisiny Etna wines also seemed to show good acidity and astringency, which made them very appealing. A star wine for me was the Pinot Noir 2012, grown at the high altitude of 900m. This definitely showed varietal character, but was a Pinot Noir unlike any other I have tasted. In addition to the intense fruit, it had a remarkable focus, and a steely minerality. We also tasted the 2013, which was a little frizzante and farmyardy – fermentazione malolattica. Towards the end of the tasting, we had the mini-vertical of Etna Rosso – 2012, 2010, 2007 and 2005. All were very enjoyable. The 2012 was still very astringent, but not such that it would stop me drinking it with food, and I thought the 2007 and 2005 were fully mature. After the tasting I bought a bottle of Etna Rosso 2004 without reflecting on it too much, but was later told that Calabretta sell their Etna Rosso only 10 years after the vintage, when it is judged to be ready for drinking – a fine principle that I wish more producers would adopt. The other two bottles I bought, based on my liking of the barrel sample vintages, were Nonna Concetta 2010 and La Contrada dei Centenari 2011. The Etna Rosso was a very reasonable 12 Euros at the cellar door, and would be likely to sell for around £20 in the UK, if you can find it at all. I didn’t see a complete price list, but none of the wines I bought were over 15 Euros. If you think you might wish to buy several cases, as well you might, take plenty of cash as credit cards are not accepted. This entry was posted in General, My tasting notes and tagged etna, italy, sicily, tasting note, travel. Bookmark the permalink.